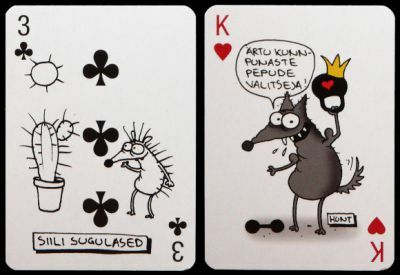 Mürakarud (The un-Bearable) are cartoons characters by Urmas Nemvalts, published since 1998 in the Estonian daily newspaper Postimees (The Postman). In the box, a label looking like the tobacco packaging warning message tells us that the cards may affect our mental health. Sample cartoons can be found in many web sites like postimees.ee or paanikaosakond.ee. There is another pack with different figures had been published by Postimees few years ago. Translating the cards are not easy. I just know that 'Siili' is 'hedgehog' and 'Siili sugulased' is 'crew relatives'.